Nerja is the busiest tourist resort and is located on the eastern side of the Costa del Sol in Spain. This upmarket resort attracts many families with children for their summer holidays owing to its fine weather and beaches. 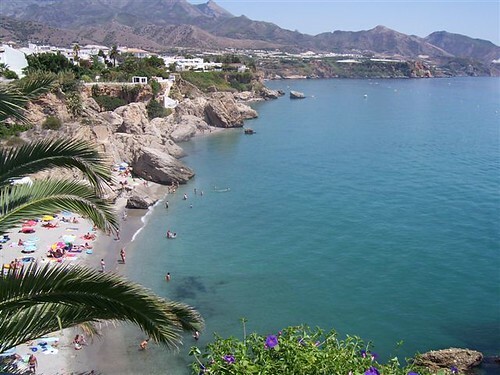 Nerja along with Marbella, Puerto Banus, Estepona, Sotogrande, Torremolinos and Benalmadena are the busiest tourist resorts on the Costa del Sol. The price comparison search engine below finds the cheapest Nerja car hire deals. Giving you the lowest and cheapest price for renting a car in Nerja. Nerja isn’t set amongst abundant golf courses and the closest one is the Baviera Golf Course which is twenty minutes away by car on the outskirts of the tourist resort Velez-Malaga. A little further along the N340 is the Añoreta Golf Course which is on the outskirts of the tourist resort of Rincon de la Victoria. To the east of Nerja the nearest golf course is the Los Moriscos Club de Golf which is located between the resorts of Salobreña and Motril. Nerja is known for its caves and its close proximity to Granada which is the gateway to Europe’s most southerly ski resort set in the Sierra Nevada, Pradollano. Granada itself is worthy of a day out with its Moorish castle the Alhambra is a tourist hotspot for day visitors. Another fantastic day out can be enjoyed at the attractive white-washed village of Frigiliana. The neighbouring tourist resorts of Torrox and Almuñecar are also worth a visit. Nerja has a nice selection of bars and restaurants as well as some fine tapas bars. Lazy days can be spent on Nerja’s beaches of which there are as many as ten. Nerja beaches includes the Playa Burriana, Playa Torrecilla, Playa el Salon, Playa Calahonda, Playa Carabeillo, Playa el Chucho, Playa El Chorillo and the Playa El Playazo. Nerja has two airports within an hour drive away by car of which Granada Airport is the closest. Granada Airport is one hundred kilometres away and a travel time of approximately ninety minutes, has a fairly limited range of services to the United Kingdom and currently the only services available are from Liverpool and London Stansted with Ryan Air. Malaga International Airport provides the most daily services from the United Kingdom to the Costa del Sol and is a little over seventy kilometres away with a travel time of close to an hour. Almeria Airport provides a further gateway for tourists and with a distance of one hundred and fifty kilometres away and a transfer time of two hours. There are numerous way for tourists to travel from all three airports to Nerja of which the most hassle free is a taxi. Taxi fares from Granada to Nerja will cost approximately €114 each way, while from Malaga Airport you can expect to pay €69 and from Almeria Airport you can expect to pay anything from €150-€180. Currently there are no rail connections from either the cities or airports of Granada, Malaga and Almeria to Nerja. Looking at bus services from Almeria Airport. You can take the airport bus to the city centre for €2 and then take the bus to Nerja. There are fourteen daily services with varying journey times ranging between four and nine hours. A single ticket costs €14.11 and a return €25.66. For more information and a timetable you can look at http://www.alsa.es.This option is not ideal for families with small children. From Granada Airport there are three daily services to Nerja with a journey time of two hours. A single fare costs €9.81 while a return costs €17.70. This is an ideal travelling time for people who do not wish to hire a car save money and relax in the resort. For more information and the current timetable you can look at http://www.alsa.es. The shortest travel time by bus is from Malaga International Airport. With a travel time of eighty-three minutes there is one daily service at 11:00 A.M. at a cost of €4.13 for a single and €7.47 for a return ticket. You can book your tickets on http://www.alsa.es. Looking at direct transfers with a company such as Shuttle Direct from Granada Airport to Nerja, a return direct transfer for a family of four will cost £328.31, £281.07 from Almeria Airport and from Malaga International Airport you have the cheaper option of a shared ride shuttle service for £71.50 for a family of four or £150. 52 for a private transfer with a driver. Granada Airport car rental companies include Auriga Crown, Avis, Europcar, Goldcar Rental and Sol-Mar. Almeria Airport car hire companies to compare rates with include Auriga Crown, Avis, Centauro, Europcar, Goldcar, Hertz and National Atesa. At Murcia Airport you can choose directly from Auriga Crown, Avis, Centauro, Europcar, Goldcar, Sol-Mar and Victoria Rent a Car. As Malaga Airport is the fifth largest airport tin Spain there are also quite a few car rental companies to compare quotes with includes Auriga Crown, Autos Lido, Avis, Europcar, Goldcar Rental, Hertz, National Atesa, Record, Sixt and Sol-Mar. Each car hire company has its own terms and conditions but they all tend to have some of the same rules and regulations which can be seen below. Are there any restrictions to car rental? Obviously you need to be in possession of a valid drivers’ license and a passport which you must present to the agent at the time of collection as well as the credit card with which the reservation was made. Often you may also put a named driver on the car rental agreement completely free of charge which is great if you want to drive long distances and share the driving. A money saving tip when it comes to car rental is to put the oldest person forward to make the car rental booking as experienced drivers often get a better rate than a young person. There are also age restrictions. While there is no maximum age restriction there is a minimum which dos vary from company to company. Some will accept drivers as young as twenty-one years of age while others have a twenty-five year age minimum. What is included in the price of the car rental? The most important thing that is included in the car rental is insurance. You will be minimally insured while driving in Spain so that in case of an accident the car is covered as well as the third party. Smaller items such as tyres, keys and windows can be insured at a small surcharge. Petrol is another important issue. Depending on the airport you are flying into as well as your flight timetable can help determine whether you should book an empty car that doesn’t need refilling or a fully fuelled car which needs to be refuelled on your return. The nearest petrol station to Almeria Airport is one kilometre away while the petrol station nearest Malaga Airport is located at the entrance. There is also a BP petrol station less than a five minute drive away from Granada Airport. Petrol is an important issue when it comes to car rental. You must refuel the car before you return it if you have rented a car with a full tank, otherwise the rental company will fill the car and charge their rates to your credit card as well as an extra charge for doing so. Luckily car hire usually includes unlimited mileage which is great if you intend too make the most of your vacation to Nerja and the surrounding resorts. Am I liable if my rented car is stolen while I am on holiday? Part of the insurance covers theft protection so you need not be concerned. If you intend to drive the car longer than the rental agreement you must inform the agent otherwise they may report the car stolen and you will be saddled with the administration charge. If you do return the rented car more than two hours later than the time stated on the rental agreement you may find yourself paying for an extra day. What happens if I receive a traffic fine. Typical traffic violations include speeding and parking and it is best you sort those out yourself at the local town hall in Nerja or at least inform the agent on returning the vehicle, because if you don’t that too will be charged to your credit card after your return home with an administration charge on top. Another niggling worry that many drivers have is what happens if my car breaks down? In the price of the car rental is included a twenty-four hour break don service so help is never far away and you have no problems having to deal with car repairs and garages. Optional extras on offer include car seats for babies and small children. These should be reserved at the sane time as you make your reservation otherwise you may find that you arrive in Spain and have to visit the nearest superstore. A GPS also counts as an optional extra which you can pre book. Although it comes as a standard for the more luxurious models you can choose to book one with the car rental firm, rent one in the U.K. or bring your own. Please note that that the insurance does not cover your GPS so if you hire one locally be sure to insure it as they are popular items to steal. Further optional extras include snow chains, ski racks, roof racks and roof boxes. Snow chains are a must in the winter months if you intend to make your way to the Sierra Nevada for some winter sports. Car rental is seasonal so you can expect to pay more in the months of July and August compared to April and May. The earlier you make your car hire booking the more likely it will be that you will get a very good deal. Examples of car rental at Granada Airport with Car Trawler are £175 in a small economy vehicle such as a Peugeot 107 for a week during the peak month of August. A mid range family sized car can be booked for £251 in a Toyota Avensis and £507 for a people carrier such as 7 seater Volkswagen Touran. A luxury vehicle such as a Mercedes E Class will set you back £1053. At Almeria Airport during the same period of time with car trawler you will pay the same as you would at Granada Airport. Malaga Airport has slightly cheaper car hire for the same period of time with Car Trawler. A Peugeot 107 will cost £125 for a week, a Toyota Avenis £226, £507 for a 7 Seater Volkswagen Touran and £540 for a luxurious Mercedes E Class. “Nerja Best Cars Welcomes you to our website. If you are looking for Holiday-rental or car-rental, during your vacation in Nerja (Malaga) on the Costa del Sol in Spain than we are the company you are looking for. Malaga Airport is not only the closest airport but provides the cheapest car rental quotes of the three airports you can fly into.